When you learn how to reheat tater tots so they are crispy, you will always want to do it. We are always excited when we prepare or buy our tater tots. They are delicious and we can’t get enough of it. However, we may not be able to consume all the tater tot casserole that we have. If you don’t like throwing away food then you will preserve it as most people do. The challenge comes in when you want to eat your leftover tater tots. They don’t taste the same when they are cold. What do you do? Here’s where the correct methods of reheating tater tots come in handy to make sure they come out hot and crispy. One thing that individuals don’t like about using the oven to reheat tater tots is that it takes. The good news is that it will give you excellent results. Your tater tots will come out hot, crispy and golden brown in color. Here’s how you can go about it. Preheat your oven up to 350°F. Get an oven-friendly plate and put your Ore-Ida tater tots in it. Use aluminum foil to cover the plate. Get the dish in the oven and give the tater tots around 15 to 25 minutes to get hot. It is vital to frequently check on them because they can get burnt or overheated depending on how hot your oven gets. Remove the tater tots from the oven and enjoy your meal. This method also works perfectly for reheating French fries. Before putting in your fries, you can preheat the oven between 300°F to 450°F depending on the heat your oven gives off. Remember to spread out your French fries on the baking sheet to ensure they warm up thoroughly and uniformly. When reheating fries, use a heavy and superior quality baking sheet. That will help you to get crispy French fries. Although there are various ways of warming up your tater tots, using a frying pan or a deep fryer is the best way of doing it. This method will make your Wegmans Organic tater puffs taste like they did when they were freshly made. They will be extremely tasty, crispy on the outside with a golden brown color. Put the tater tots in the deep fryer and take them out after one or two minutes. You’ll get the same results as when they had just been prepared. If you are using a pan or skillet, here’s what you can do. Pour a little oil or non-stick spray. Let the pan heat up. Put the tater tots in the pan. Give them one minute to warm up and then turn them over to allow the other side to also heat up. Remove them from the pan or skillet and toss them on paper towels to soak up the extra oil. Check your tater tots to ensure the inside part if hot and the exterior is crispy. This method is popular among people who reheat French fries too because it helps to achieve maximum crispiness. Make sure that the pan is extremely hot before you throw in your fries. Use little amounts of oil when warming up the French fries because they generally retain oil and so they will have some on them even when they are cold. If you want a crunchy and delicious taste then you should heat up your tater tots in a toaster oven. Preheat the toaster oven until it gets to 400°F. Choose the middle position of the oven as the position for your tater tots. Place the Alexia Potato Puffs in one layer on the baking dish. Get your tater tots in the oven. Use a spatula to flip them over to ensure they warm up evenly. Remove them from the oven and enjoy your meal. Some people will tell to never think of warming your tater tots in the microwave. However, if you decide to go with it, you may need to do some testing before you find out the best way of reheating them using a microwave. One minute is enough for tater tots to get warmed up in the microwave. That means you should reheat each side for 30 seconds. If you leave them in the microwave for too long, they will come out soggy and mushy and you wouldn’t want to eat them. You may have heard people talking about tater tots a lot and you wonder what they are and why there is so much fuss about them. Well, these are simply potatoes that have been grated and deep fried. They are cylindrical in shape and have a crispy exterior. 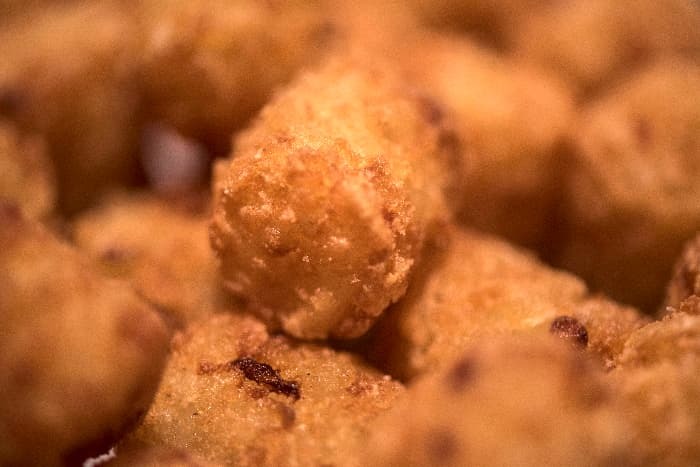 Tater tots not only look but also taste delicious. They are a favorite in most American households and are prepared as a side dish. Sometimes, it is included in the main course. Nephil Grigg and Golden Grigg were the first people to prepare the delicacy. This happened in the United States in 1953. The Grigg brothers made French fries which was popular at the time. However, they had one challenge. The machine they were using couldn’t isolate the fries and the fragments which meant they got silvers from the potatoes. The brothers got another technology which could separate the two but they found themselves with plenty of leftover potatoes. They started thinking of ways in which they could use the potatoes instead of throwing them away. Nephil Grigg and Golden Grigg then had the idea of cutting the slivers then putting some seasoning and flour to it. After that, they smashed the mixture together and that is how the first tater tots came about. The brothers did this at the Ore-Ida Labs which they owned. Since this was a new type of food that had just been made, it did not have a name. Therefore, it was simply referred to as a combination of tatter which means potato and tots which means little one. That’s where the name tater tots originated from. Tater tots have become so popular in America to a point where there February 2nd was set aside to celebrate them. That day is the National Tater Tot Day. Every year, people in the United States eat over 70 million servings of this delicious food. If you have been throwing away your leftover tater tot casserole or eating it cold, you no longer have to do that. Simply choose which method of reheating them is convenient for you in the sense of the results you want and the warming appliance you have. Practice how to reheat tater tots and you will have fun doing it.